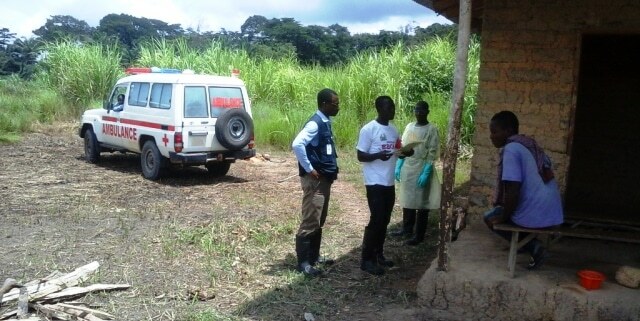 Dr John Ekow Otoo (in blue) working in Kailahun which was the first district that recorded no new cases of Ebola in Sierra Leone. Mr John Ekow Otoo and Ms Gifty Sunkwa-Mills, two former Danida Master students, left Ghana to go ‘to the battlefield’ to fight the deadly Ebola virus that has caused more than 10,000 deaths in West Africa. Dr John Ekow Otoo took a bold and dangerous step. He got involved as a Consultant Epidemiologist for the World Health Organisation (WHO) in the Ebola virus disease outbreak in Sierra Leone from 5th of September 2014 to 22nd of November 2014. As Field Coordinator for the WHO team based in Kailahun, he chaired both the coordination pillar of the Ebola outbreak response team and the surveillance and contact tracing team. But his and other colleagues’ dangerous work bore fruit. Kailahun was the first district which recorded no new cases of Ebola in Sierra Leone before the end of 2014. “I am proud to say I was part of the team that worked to make this possible,” John says. While John was in Sierra Leone he made a telephone call to his friend Dr Gifty Sunkwa-Mills back in Ghana saying: “I have been called to the battlefield”. Gifty’s heart skipped a beat when he mentioned the word ‘Ebola’. “I admired John’s boldness, initiative, sense of adventure, and passion to help. I cautioned him and urged him on. Also very importantly, I took Inspiration from him!” Gifty recalls. A few weeks later, Gifty found herself on a flight to Monrovia, the capital of Liberia. Eventually, Gifty was posted to Margibi County as a Consultant Epidemiologist and Field Coordinator for WHO. Here she had numerous meetings with the County Health Team and other partner organizations and NGOs. She also interacted with contact tracers, case investigators, burial teams and other working groups. On several occasions she went with the teams on long trips to districts and villages to pick up and transport suspected cases to Treatment Units. The result of Gifty’s work in Liberia was obvious. “It was a joy to see the suspected cases being identified early and getting prompt treatment due to the establishment of an effective surveillance system,” she says. But Gifty had also heard touching stories of many of the victims of the deadly Ebola. “I was convinced that I had taken a good decision to come and assist in the humanitarian crisis. In one of the hospitals, over a dozen health care workers had died of Ebola. These were people who had laid down their lives to save that of others,” she says. While in Liberia, Gifty exercised extreme caution every step of the way: “I had to be safe and alive to be able to help and save others,” Gifty explains. Both Gifty and John are former Danida fellows having studied Master of International Health at the University of Copenhagen. The both agree that their experiences from Denmark have been very valuable while fighting the Ebola disease. Gifty learned a lot about the tasks of the public health physician, as a leader in the health sector. “I also studied Epidemiology, and learned a lot about health systems in developing countries and these were very helpful in the fight against Ebola,” she says. John’s increased knowledge of global health issues was important. He also thinks that he learnt a lot about diplomacy managing very sensitive information and situations while being in Denmark. Both doctors have now ended their mission to the Ebola-stricken areas and have returned to Ghana. John is now helping the Ministry of Health develop systems to manage a case of Ebola if Ghana should have one. He is specifically involved in developing “A Pocket Guide to the Clinical Management of Ebola Virus Disease in Ghana”. He is also involved in training health workers and helping Regional and District Health Management Teams as well as setting up Ebola Virus Disease Rapid Response Teams. “With this magnitude of an outbreak, Ebola will, unfortunately, linger around for a while. There is the urgent need to build strong and effective health systems with robust surveillance systems and emergency response systems alongside developing effective but relatively cheap vaccines and treatments,” John explains. Gifty, who is also back in Ghana, agrees that building robust surveillance systems is the way forward. “I look forward to the day when the fight against Ebola will be won once and for all,” Gifty concludes. 36 years old Ghanaian, married with two children. He is currently a Resident Public Health Physician with the Ghana College of Physicians and Surgeons specializing in Epidemiology and Disease Control. Studied Master of International Health (MIH) at the University of Copenhagen, Denmark. Study period: 2011 – 2012. John stayed at the Danida Fellowship Centre at Frederiksberg. 34 years old Ghanaian, married with 2 children. She is a Resident Public Health Physician with the Ghana College of Physicians and Surgeons specializing in Health Policy. Studied Master of International Health (MIH) at the University of Copenhagen. Study period: 2010 – 2011. Gifty also stayed at the Danida Fellowship Centre at Frederiksberg.